Additional reporting contributed by Nina Horowitz. PALO ALTO, Calif. — If you were hoping for an obvious answer to ‘who is the best team at the Bay Area Invite?’ you will be disappointed. Let’s dig into the second day of action from the late season west coast battle. On Saturday, #1 Seattle Riot matched up against #3 San Francisco Fury in the final round of the day. Riot’s 15-12 loss dropped them to 1-2 ahead of a Sunday morning showdown against 3-0 #4 Denver Molly Brown. Immediately following that game, Molly Brown would take on Fury in another high-profile clash. Here we provide recaps of both critical games as well as an analysis of what to expect from all the teams at the tournament heading into the club series. Riot entered the game with two wins against Molly Brown on the season (a double game point win in the Pro-Elite Challenge final and a three goal win in WUCC semifinals). However, Molly Brown dominated Saturday competition, winning each of their six halves by at least two goals. Plus, superstar Claire Chastain returned to the team on Sunday. Meanwhile, Alyssa Weatherford, Claire Trop, and Julia Snyder all joined Riot for Sunday’s games. After a game opening hold by Riot, Molly Brown’s offense looked unpolished. A series of missed swings, overthrows, and execution errors led to three early Riot breaks. Just twenty-five minutes into the game, Riot was up 6-2. Molly Brown took a timeout. During the timeout, Molly Brown coach Joe Durst implored his team to focus on throws and catches. Several pairs of Molly Brown athletes began throwing on the sideline. And Molly Brown’s offense improved. Molly Brown sandwiched a one-possession break with two clean holds, and the score was 8-5 Riot at halftime. The teams traded holds until 11-8 (five of the six points to start the second half were clean holds). On the seventh point, Molly Brown turned over the disc on their own goal line, and Riot capitalized on a Kelly Johnson assist to Steph Lim to make the score 12-8. However, Molly Brown didn’t quit; they earned two breaks back, powered by a Victoria Elmore assist and then a sky to pull to within one, 14-13. On the crucial point, Kiera Lindgren recorded a game-saving block in the endzone. Molly Brown moved upfield 20 yards before calling a timeout. Riot responded by throwing a junk defense. Molly Brown moved upfield another 20 yards forcing Riot to switch into a person defense. However, at that exact moment, Shira Stern anticipated a reset pass and recorded the momentum-shifting block. A few passes later, Paige Soper scored the clincher to give Riot the 15-13 win. 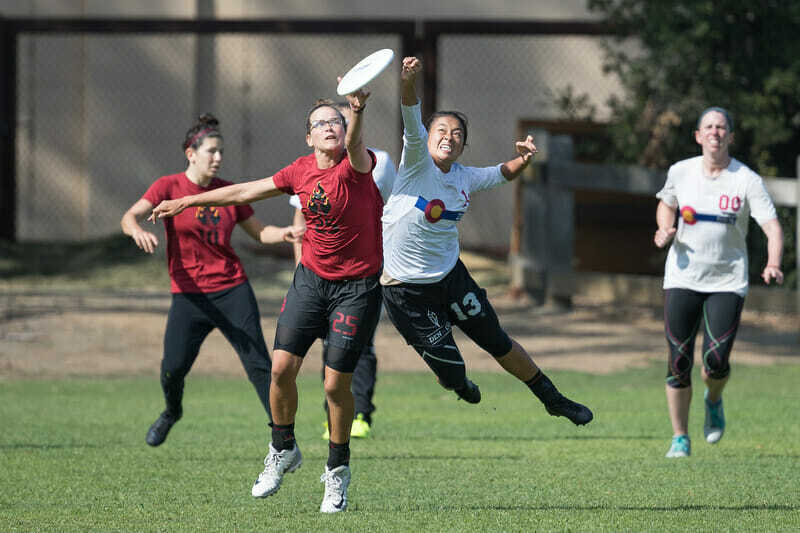 Fresh off of their frustrating loss to Riot, Molly Brown was angry and looking to prove themselves against the last undefeated team in the tournament: Fury. The home team had just won their game against Traffic in somewhat shaky fashion, getting broken twice in the first four points but then calling a timeout to regroup and take half before eventually winning 15-11. Both Fury and Molly Brown took the field with their fair share of nerves, and it showed. The first break of the game came on the third point thanks to a Molly zone defense and a huck into coverage from Alex Snyder. The Coloradans converted to take the lead 2-1, but Fury held to tie the game back up and then Claire Chastain threw a turn of her own. Fury converted it for their first break and put themselves back in front, 3-2. The rest of the game continued in similar fashion – Molly Brown held, then broke right back to retake the lead. However, Fury responded with two breaks of their own during the next several points, and the half ended with Fury up 8-6. Clean holds were few and far between during the first half, but that was only partially because of tight defense. More often than not, turns came from simple execution errors. Although Chastain was making full use of her lethal arsenal of throws and Lisa Pitcaithley and Lisi Lohre provided critical offensive flow, Molly Brown often had trouble scoring on their first possessions. Similarly, despite strong showings by Lisa Couper, Bethany Kaylor, Cree Howard, and Carolyn Finney, Fury alternated between quick and almost effortlessly clean holds – usually when they utilized their side stack offense – and more drawn-out back and forth battles. Fury looked much sharper at the beginning of the second half, immediately rattling off back-to-back breaks to put themselves up 10-6. They forced Molly Brown to use difficult low-percentage throws, and, on defense, Fury prioritized taking their first open option to score as quickly as possible. But the four point lead made them a bit too comfortable, and the San Francisco team failed to convert on their next two break chances. Molly Brown held to make it 10-7, then broke twice in a row thanks to stellar defense by Jesse Shofner to bring the game back within one. Both teams held on their next points, but then Fury got broken on a simple throwaway, and the following marathon point featured turns from both teams until Molly Brown finally pulled through and broke again to take the lead, 12-11. Soon after, Molly Brown managed yet another break on a first throw turnover by Fury to make it 14-12. After quick holds by both teams, the game ended 15-13 on a beautiful crossfield backhand huck from Chastain. That meant that Fury beat Riot 15-12, Riot beat Molly Brown 15-13, and Molly Brown beat Fury 15-13. (You can watch all three games by becoming a Full or Plus subscriber!1 ) In a classic case of rock-paper-scissors, each team’s strength seems to be the other’s weakness. Here are our takeaways on the top three teams and the rest of the competition after two days of tough battles. Molly Brown (5-1): With the return of Claire Chastain on Sunday, Molly Brown’s offense looked stronger and more versatile than the day before. Their deep roster of cutters – most of whom are equipped with break throws and crafty hucks – proved difficult to guard, especially when their handlers were clicking and distributing to power positions on the field. On defense, they used their zone set effectively, transitioned well between zone or poachy looks and tight person defense mid-point, and did a good job of ensuring that their handler marks were taking away a different set of options than the cutter defenders. However, they struggled with their red zone offense once they generated turnovers – especially against Riot – and their defensive line often couldn’t find the same flow their offensive line seemed to have in spades. These struggles allowed lower-level teams to score far more points than they should have, which meant Fury looked more nervous than usual and couldn’t settle into their typical confident groove. They often relied on their handlers to hit difficult angles, and they sometimes cut each other off when making cuts. Defensively, Fury took several points at the beginning of each game to adapt to the teams they were playing against. Even when they generated turnovers, they often needed several attempts to convert them successfully. Coach Matty Tsang found himself calling timeouts early in many of their games. But whatever he was saying in their timeout huddles, it was working – they came back out of them disciplined and made the necessary adjustments to go on multi-point runs that disheartened even their toughest opponents. At times when the team was in sync, they earned blocks seemingly at will due to their utilization of switching defense on tricky handlers and sheer athleticism to shut down under looks from cutters. “Against Traffic, we did well on playing tight and making them throw pressured throws,” said Magon Liu. Finding their rhythm enabled them to take bigger risks on offense, especially with their side stack and deep looks. But it would be nice to see the team succeed without taking timeouts to regroup on both sides of the disc. The teams at Nationals won’t give them those same chances to climb back in games. Riot started out on fire against Molly Brown, going up 6-2. While Riot excelled at mixing up defenses and forcing Molly Brown out of their scripted pull plays, the difference in the game was Riot’s ability to capitalize on turnovers, an area where they struggled on Saturday. The Seattle team finished the Molly Brown game with four breaks on seven chances, reminiscent of dominant, efficient Riot defensive performances earlier in 2018. If Riot can avoid the lapses of focus that plagued them on Saturday, they might reassert their claim as the favorite at Nationals. The most surprising game of the weekend was unquestionably #11 Vancouver Traffic’s upset win over Seattle Riot on Saturday. Standout athlete Rachel Moens said the win “especially felt so good because we played Riot at Worlds and just really did not have the game that we wanted to play against them. It felt really good to come back and show them and show everyone that we can do a lot better than that.” After that huge upset, Traffic kept up the intensity for the rest of their games. On Sunday, Traffic ended the first half against Fury on serve, had a close game against Underground, and jumped out to a 14-8 lead over Nightlock. As far as Traffic’s key to success, most observers would credit their talented throwers and speedy deep game. But Moens thinks it’s more than that. But the team needs to step up their game in order to be a true contender in the postseason. “We’re going to work on making it clear who our options are, initiator, continue, that whole thing, making sure there’s lots of communication on the field,” she promised. #7 San Francisco Nightlock had a good Sunday. They won comfortably over Underground, stormed back in the second half against LOL, and battled Traffic right to the very end. Nightlock is anchored by some top-notch defense. Claire Sharman recorded six blocks (!) in the second half alone against LOL, a half that lasted only six points. Against Traffic, Nightlock’s defensive line scored six goals, four of which came on a late-game blitz to turn a 14-8 game to 14-13. Shayla Harris consistently made big defensive plays up and down the field. However, the two-goal loss meant that Nightlock’s offense got broken seven times. Offensive efficiency is what separates Nightlock from teams like Molly Brown, Fury, and Riot. Fortunately, Nightlock has three weekends until Regionals, and, if all goes well, another two weekends until Nationals. Seattle is a city with depth upon depth, and #20 Seattle Underground came to the Bay Area Invite to prove it. LOL played much better on Sunday. They upset Schwa 14-12 and took half on Nightlock 8-7. This group of high-IQ veterans certainly has the potential to make a dent in the series. There is a potential rematch with Nightlock looming at Regionals. 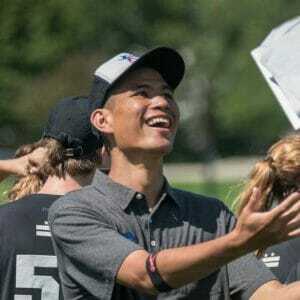 According to Cody Mills’ frisbee-rankings.com, #21 Portland Schwa’s losses to LOL and Riot (a 15-5 drubbing which finished on an 11-1 Riot run) dropped them 33 points in the rankings. However, a 14-10 loss to Molly Brown allowed Schwa to gain 8 points back. Schwa played an excellent first half against Molly Brown, trailing 8-7 at the break. Schwa’s Eva Popp said, “The Molly Brown game was a gritty battle that had a number of long, multi-possession points that were kept alive by some extremely athletic plays.” By scoring three additional goals in the second half, Schwa did just enough to make a positive impact on the rankings. Schwa is right on the strength bid bubble; they will be carefully following Pro Championships next weekend to see if the Northwest earns two or three bids. Comments on "Bay Area Invite 2018: Day Two Recap"